Best known publically as the founding member and producer of the critically acclaimed international music project "The Fragile Path". Owns Sin Salvation Records, and has worked with friend the Legendary EN ESCH [ex-KMFDM, Pigface, SlickIdiot] who is also his musical mentor and publisher, as well as Lee Fraser [Sheep On Drugs], Scream13, the French duo Lifes Decay, Japanese madman/ author/ spoken word artist Kenji Siratori, Braille Korp, Amanda Ott & radio personality/ columnist Scott Leffler. 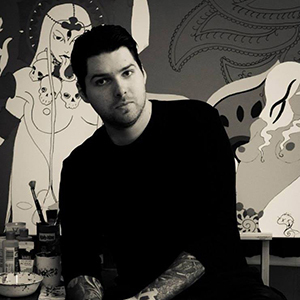 J. Nevadomski is an accomplished painter and has won a multitude of art awards over the years locally and regionally including a New York State championship. Some of his work has been featured in news papers in the Rochester area (The Democrat and Chronicle, City Newspaper), as well as on internationally published promotional materials in the music industry. He paints in two styles mainly, one a colorful abstract, and the other a kind of “Film Noir” meets “Comic Book” style, with a very minimal approach.